It’s great to have the Start button back in Windows 10, the biggest failure of Windows 8 was the lack of a start button. It’s amazing – what was Microsoft thinking when they eliminated the Start button in Windows 8. This was as large of a failure as Coca Cola had back in the 80’s with New Coke. Just like Coca Cola with Coke Classic, Windows 10 brought back what Window’s loyal customers wanted, the Start button. If you are too young to remember the New Coke fiasco you can Google “biggest product flops of all time” and it will be on all the lists! The new Start button is a little different from what we had in Windows 7, Windows XP and before, but it’s basically the same, it does what we wanted it to. Included with the Start button is a Search box in the task bar that let’s you do a search on your PC or the web. This is a great feature; if want to open a program, just type it’s name in the box and the start menu pops up with the results, just click on the one you want and it opens. After working with Windows 10 on my office desktop PC for about 6 months I began to notice that the Search Box wasn’t working anymore. I could click in it and start typing and what I typed didn’t appear in the search box. Also around this time I noticed that when the Start Button was clicked there was a small delay before the Start menu appeared and then the Start Button would stop working completely, when clicked on nothing would happen. This is my office desktop PC, I take great care to keep this system clean, only the software needed to do my job is installed on it. There had been no new software installed on this system in several months, the only changes to it were Windows updates; I was unable to track down what might have caused this issue with the Start button and search to happen. The purpose of this article is to save you time trying different solutions and show you the one that worked for me. I ran Windows updates to see if there was a patch for this and there didn’t seem to be an update for this. I did some online research to see if this was a common issue and it was and there was a number of suggestions online including creating a new user account which I tried and didn’t work. I ended up trying several suggestions but none worked except for the one I’m going to show you how to do. It involves re-installing Windows Apps through the Power Shell. 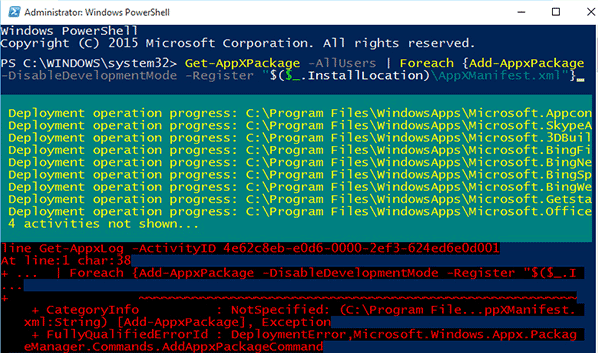 First you have to open a Power Shell prompt with administrator privileges. There are several ways to do this, since my Start Button wasn’t working here’s how I did it. Press the [Ctrl] + [Alt] + [Del] keys on the keyboard at the same time, or right click the Taskbar, and select Task manager. 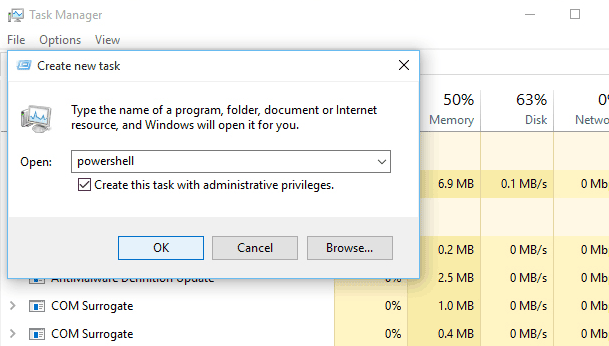 When the Task manager window opens, click the More details option to expand it, then select Run new task from the File menu. NOTE: You can copy and paste the command into the PowerShell window by simply right-clicking at the blinking PS C:\WINDOWS\system32> prompt, or by pressing [Ctrl] + [V] on the keyboard. Wait until the app download and installation process completes — ignore any red text that appears then restart Windows. Once you reboot the computer the Start Button and the Search Box should again be working normally.